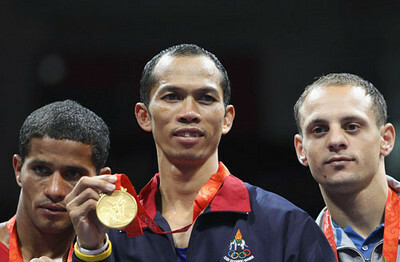 Continuing Songchai’s Olympic Heroes series Pirjnoi Sor Siamchai fights Silichai Sor Preecha. Pirjnoi is a former Lumpinee Stadium champion and Silichai represented Thailand winning the gold medal in international boxing at the 2008 summer games held in Beijing, China. Silicahi was then known by his real name Somjit Jomjohor. fantastic fight, red shorts was the olympian?